Ashland (OH) University recently completed its first-ever Manufacturing Teacher Bootcamp, providing 14 classroom teachers and guidance counselors a first-hand view of industrial processes and plant settings. As reported by Gannett, the university awarded graduate credits for teachers completing the program, which was aimed not at career prep teachers already familiar with manufacturing, but at educators who had not had much contact with manufacturing. Participants were required to develop plans for how they would let students know, during the coming year, about career opportunities at area manufacturing companies, as well as training opportunities. Teachers were split into small groups, spending 8 hr. at each of three Ohio companies: Crown Battery (Fremont), Berry Plastics (Monroeville) and Amcor Rigid Plastics (Bellevue). In this webinar we will discuss and demonstrate how NX™ Progressive Die Wizard software transforms the tooling development process with advanced automation. Knowledge-driven applications for tooling design and manufacturing. This level of knowledge driven automation improves overall productivity, accelerates the process, reduces waste and cost and improves quality. PMA and MetalForming magazine proudly announce a newly enhanced conference on state-of-the-art servo technology used in presses, transfer systems, coil-feed lines and more. Aimed at engineers and technicians working in metalforming plants, the conference will provide technical presentations and case studies describing how modern servo-based equipment can help stampers improve productivity and quality. LOGOPRESS Corp., the developer of SolidWorks-based Logopress3 which is sold in 30 countries around the world, has spent 100% of their 27 years in business exclusively developing die design software and related flattening software. Whether your need is flattening complex shaped parts, doing strip layouts for quoting or doing fully animated 3D die designs with 2D drawings, Logopress3 has a solution. Click here to watch an overview video. The international sheet metal working industry will meet again this fall in Hanover, Germany, from October 25 to 29. Visit EuroBLECH, the World's No. 1 Sheet Metal Working Technology Exhibition! Experience live machine demonstrations and the latest international industry trends. Buy your ticket for EuroBLECH 2016 now! Held this year in Nashville, TN, on September 19–21, the WiM SUMMIT is an annual conference tailored specifically for women who have chosen a career in the manufacturing industry. This networking and educational event features manufacturing plant tours, professional development tracks, keynote presentations and numerous networking opportunities. Additional event details and to register. Coming up quickly is the fifth annual edition of Manufacturing Day, October 7, meant to inspire the next generation of manufacturers. Hundreds of industry-leading organizations will do their part to promote careers in manufacturing to students, community leaders and others. For ideas on how your company can participate, visit the Manufacturing Day website. 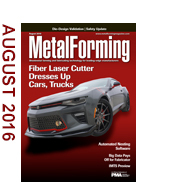 A new fiber-laser cutting machine has enabled this Chicago-area fabricator to put the pedal to the medal in churning out wheel and axle covers, grills and more for trucks and specialty vehicles. The process is increasingly automated, freeing operators for other tasks while significantly boosting productivity and material utilization. Automotive Regional Account Manager (OH) / Pennant Moldings, Inc. Engineer - Manufacturing Laser Welding/Laser Marking (FL) / Arthrex Manufacturing Inc.